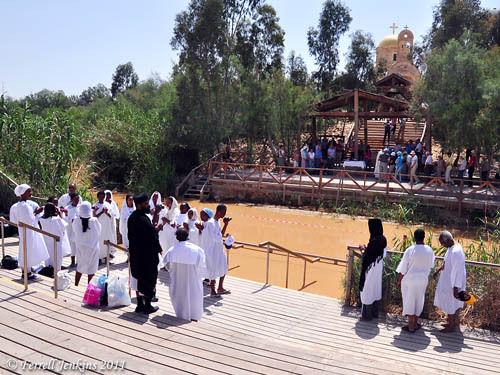 Several media outlets have reported the permanent opening of the Qasr el-Yahud Baptismal site. Our group made arrangements to visit the site May 3, but we had to wait for military personnel to open the gate. Some construction work was going on, and the road to the site needed repair. See here. See earlier reports here, and here. Some reports have warned about the impurity of the water. I advised my group not to touch it. A group of Ethiopians were dipping themselves, dipping others, and pouring water on themselves while we were there. A hand full of water looked like mud as it left the hand. 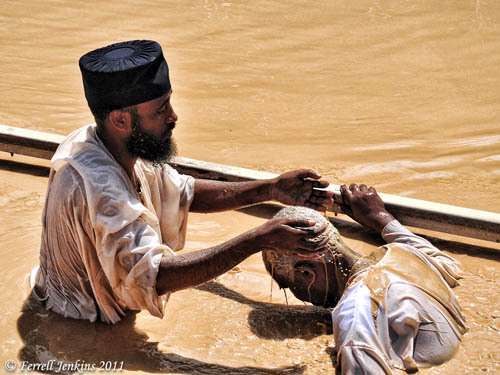 Ethiopians in the Jordan River at Qasr el-Yahud. Photo by Ferrell Jenkins. Personally I understand baptism to be a one-time act “for the forgiveness of your sins” (Acts 2:28; 8:12; Matthew 28:19; Mark 16:16; Romans 6:3-4; et al.). Bible students like to visit the Jordan River at this site for several reasons. Ancient Israel crossed the Jordan to enter the promised land (Joshua 3). Elijah and Elisha crossed the river (2 Kings 2). John baptized in the Jordan (Matthew 3:6ff. ; Mark 1:5-9; John 1:28; 10:40). Jesus was baptized in the Jordan (Matthew 3:13). Naaman dipped in the Jordan at a site further north (2 Kings 5). The view was made from the West Bank site looking northeast. A group of western pilgrims are visible on the (Hashemite Kingdom of) Jordan side of the river. Jordan River Baptismal Site. View to the NE. Photo by Ferrell Jenkins. This entry was posted in Bible Places, Bible Study, Israel, Jordan, New Testament, Old Testament, Photography, Travel and tagged baptism, Ethiopians, John the Baptist, Jordan River. Bookmark the permalink. I’m wondering about the possibility of using the Ethiopian baptism photo on this post as part of a collage for a CD cover. Please contact me at talk2us@christophergrundy.com. Thanks for your time. Peace.